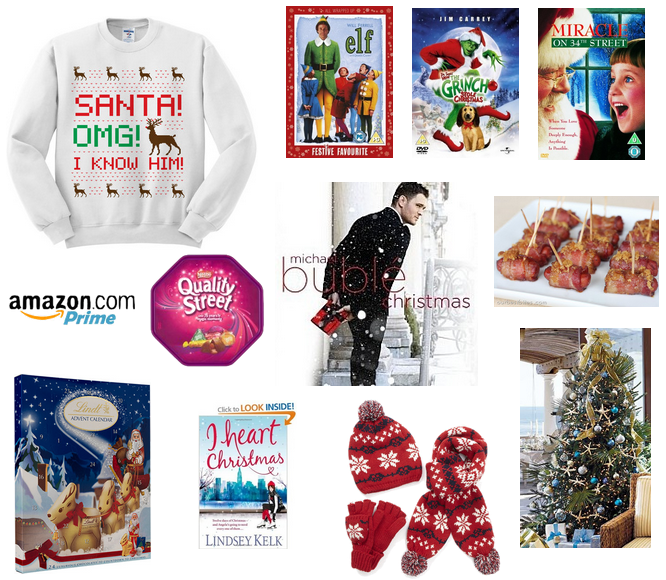 Beautiful You: #CountdownToChristmas Week 3 | Christmas Survival Kit! #CountdownToChristmas Week 3 | Christmas Survival Kit! I was also contacted by a company called 'Man Crates'. They are a new company 'that ships awesome gifts for men in custom wooden crates that he has to open with a crowbar and it is their mission to end the difficulties that have long been associated with buying gifts for men. They asked me to get involved with their company and put together a survival kit for the holiday season and I thought it would be good to incorporate this into the series. Therefore this week we thought that I would be nice for us to all share what we can't live without during the Christmas period. I know a lot of people love to watch Christmas films, wear festive jumpers and spend time with family but what do you love? 1. Christmas Jumpers- I love a good Christmas jumper when it comes to December you cannot beat them. My one that I have this year is from Asda and it has a reindeer on, if you tap the nose it sings jingle bells and flashes red! But Primark also have an amazing collection of them like they do every year so if you don't have one then definitely head to your local store and pick one up! 2. Christmas DVDs- I have watched so many of these already but its Christmas so what else can I do. I have a few favourites such as Love Actually, The Grinch and Jack Frost, I also really love the golden oldies such as Christmas with the Kranks and Deck the Halls they are completely ridiculous but still amazing! 3. Amazon Prime- this has been a life saver for me this year as I have left getting a few presents until the last minute. Anything that you want to buy from Amazon will be delivered the next day free of charge, what more could you want at Christmas?! 4. Boxes of Chocolates- these are definitely a well known Christmas must have, sitting around watching Christmas TV with a box of these going around the family! My favourites have to be heroes because dairy milk is the best and I'm not really a fan of quality streets but my sister is so we have to get both. 5. Michael Buble Christmas CD- I cannot tell you the amount of times my sister has made me listen to the album, but I can't complain because his voice is magical. I love all his covers and if you haven't listened to this album then you definitely should, Jingle Bells is my favourite. 6. Pigs in blankets- this is the reason I look forward to Christmas so much, pigs in blankets are the best part! I literally cannot wait until Christmas Day when I get to eat a massive Christmas lunch without feeling guilty at all. 7. Advent Calendars- who doesn't love waking up to chocolate everyday? I am a bit picky when it comes to advent calendars because I have to have a branded chocolate one otherwise I won't eat them. This year I have a malteaser one which is really good! 8. Christmas Books- seen as I love reading I like to put the festiveness and this together and find a Christmas book to read whilst I'm on holiday. This year I am going to read I Heart Christmas because I bought it for my sister last year and I can remember her telling me how much she loved it! 9. Winter Woolies- I cannot think of anything better than wrapping up warm in hats, gloves and a scarf on a winter day. I spent today and yesterday in London and I did just that because it was so cold, these are definitely a must have during the festive period. 10. Christmas Decorations- no one can go through the Christmas time without putting decorations up. I love driving around and seeing the lights outside all the houses, it gives a sense of community and I think they look really nice. I also love seeing how other people decorate their trees and what colour schemes they go with, my previous post is all about ours so if you would like to check it out I will link it here! I hope you enjoyed seeing what I cannot live without through the Christmas period, what are your must haves during the festive season? Do you own a Christmas jumper? Let me know in the comments below and I will try and reply to you! Like I said I was in London today and yesterday so you can read all about my trip and what my sister and I got up to on Wednesday. I will see you all on Monday and I hope you have a lovely weekend!